Kingston announced the DataTraveler® Ultimate Generation Terabyte (GT), the world’s highest capacity USB Flash drive today. DataTraveler Ultimate GT offers up to 2TB of storage space and USB 3.1 Gen 1 (USB 3.0) performance. Power users will have the ability to store massive amounts of data in a small form factor, including up to 70 hours of 4K video on a single 2TB drive. DataTraveler Ultimate GT offers superior quality in a high-end design as it is made of a zinc-alloy metal casing for shock resistance. Its compact size gives the tech enthusiast or professional user an easily portable solution to store and transfer their high capacity files. For more information please see below or refer to the following reference table for storage capacities. This will be interesting products every consumer will talk about. 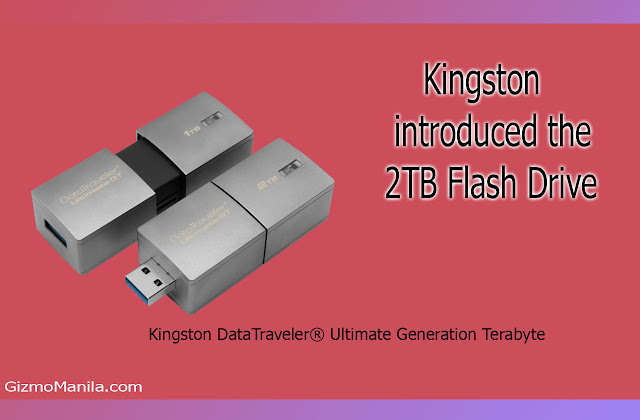 A portable storage device that is size as a thumb that can store data as same as the portable Hard Drive which is 20x bigger and heavier than DataTraveler® Ultimate Generation Terabyte .